BRC Standard for Packaging and Packaging Materials provides a common basis for the certification of companies supplying packaging to manufacturers and retailers. The BRC global standard for packaging was revised in July 2015 to assist retailers and manufacturers in meeting their legal obligations. BRC packaging ensures transparency and compliance with fair trading legislation and continuously reviews and improves standards and supporting processes. Requirements of BRC packaging standard include hazards and risk management system, technical management system and contamination controls by scientific approach. Certifying your organization against the Global Standard for Packaging and Packaging Materials Issue-5 requirements can bring customer satisfaction through BRC certification to a recognized standard. We are a leading certification documents selling company that offers system documentation and training presentation kits for various management systems. We are having global clients in more than 65 countries, including USA and UK. 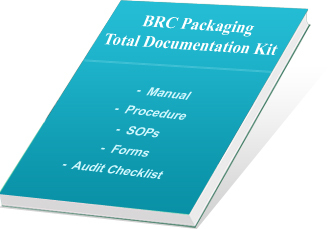 We offer BRC IoP Issue-5 Documentation Kit for BRC packaging certification requirements. This documentation kit contains ready-to-use pre-formatted sample BRC documents as per requirement of BRC packaging safety standard issue-5. Written in plain English, the entire BRC packaging documents are in editable MS Word format. Using this ready-to-use BRC IoP documentation kit any organization can prepare complete set of ready-made BRC packaging documents for their own company within minimum cost and time period. With the help of our ready-to-edit BRC food safety documents,our many global clients got certified in first attempt from stringent certification audit. What Does BRC Packaging Standard Documentation Kit Offers for BRC IoP Certification? These globally used BRC/IOP standard certification documents for packaging and packaging materials include sample copy of BRC manual based on Issue no. 5 of global standard for packaging 2015, list of procedures, as well as complete overview of organization. This pre-formatted editable documentation kit contains sample copy of mandatory procedures with all the details like preliminary analysis, prerequisite program, hazards identification, HACCP plans, control of non-conforming products, corrective actions and action plan etc. Sample copy of blank forms and templates are also given for easy guidance using which organizations can make their own BRC/IoP standard certification documents as per their own requirements. With the editable BRC food safety documents having more than 32 SOPs and sanitation practices and requirement-wise and department-wise audit questions based on BRC packing and packaging material Issue 5, organizations can easily prepare their own total docuemntation. The entire BRC packaging Documentation Kit is available in editable word format so it is very easy to edit. Our more than 200 satisfied clients all over the world have used it for certification of BRC global standard for packaging within their organization. By using these documents, you can save a lot of your precious time while preparing the BRC food packaging documents. This kit takes care for all the sections and sub-sections of BRC packaging standard and helps you in establishing better system. BRC documentation kit enables you to change the contents and print as many copies as you need. The users can modify the documents as per their industry and create their own BRC food packaging documents for their organization. Readymade BRC templates and sample documents are provided which can reduce your time and cost in document preparation. The audit questions help in making perfect audit checklist for BRC certification. You will get better control on your system, as our proven formats and templates are developed under guidance of our experts and globally proven consultants having rich experience of more than 20 years. Our products are highly sold globally, used by many multinational companies and have provided total customer satisfaction as well as value for money. This documentation kit is verified and evaluated at various levels of our team and more than 1000 hours are spent in preparation of this kit. Prepared by a globally proven team of leading consultants, this kit includes BRC IoP checklist, BRC IoP manual for BRC certification. On successful completion of secured purchase, we provide user name and password to download the product from our FTP server. We provide instant online delivery of our BRC IoP packaging documentation kit to users by sending username and password by e-mail. BRC Global Standard for Packaging Documentation Kit is available at a very compatible rate and anyone can purchase it by secure online transaction with Paypal.com. We provide e-delivery by FTP download of our BRC IoP packaging documents kit worldwide and our products are used in more than 65 countries.